Greetings from the historic Gunwharf Quays in Portsmouth. Today we have the special treat of boarding MGB81 – a Motor Gun Boat – the last operational MGB from WW2 (although she is up in dry dock for some repairs at the moment). We have the great honor of accompanying John Squires, one of the original crew members of MGB503, and the family of Andrew Smith, who both helped rescue Robert Sweatt and a score of other allied airmen off a beach in Brittany in 1944. It’s in the 40’s here today, cloudy, with a fine drizzle, and my jeans have just dried out. I’ve had to wash them in the sink to get out the vestiges of mud picked up when Charley and I decided to walk out to the now derelict old fort in Gravesend-Shornemead where he was a prisoner of war in 1946-7. Along the way we tried to find the house of a family who treated him as a son while he was he here, when he would break out of the enclosure and visit with the local people. Unfortunately, their house is now gone, and its location can only be reached through a long hike through a nature preserve/firing range (interesting combination). We almost turned back after enduring about an hour of wetcoldwind filled with peppershot pellets of rain but a random jogger encouraged us to keep going. Finally, we found the spot, and then headed towards the fort, which had lost everything over the years but its outer shell. All the same, Charley was delighted to arrive and see it again. When we walked along the seawall on the Thames back to the car we sunk in mud to our ankles. Although it must have been 5-6 cold, wet, uncomfortable, muddy miles, Charley was so grateful to have the chance to visit the sites. We agreed that neither of us would have done that on our own, but the comradeship made it work. Tuesday we had a lovely drive around the countryside in Norwich until we found the estate of Ken Wallis, a British bomber pilot of WW2 and inventor of the autogiro plane. He’s 96 and still flies his autogiros around when the weather is fine. Ken is a phenomenally interesting man who survived losing several planes – parachuting out on one occasion when he and his crew couldn’t land due to fog, running into a British barrage balloon and subsequently crash landing on another. We probably could have stayed several days and just scratched the surface with Ken. While working our way south, we then interviewed Major John Semken on Wednesday. The major, also in his 90’s, is a Military Cross holder and Sherwood Ranger who served from Palestine before the start of war through D-Day, Holland, and breaching the Siegfried Line. Never a dull moment and I’m sorry I must go – next: Bournemouth and dinner with some Sherwood Rangers and then Tuesday on to the Bovington Tank Museum. Drought, Take Care With Water Usage. My time since I last wrote you has actually been spent learning valuable new skills – mainly learning how to drive on the left, running through the gears with my left hand (occasionally in the right order! ), on narrow, medieval roads and endless roundabouts avoiding pedestrians jumping indiscriminately off curbs into the roadway and all in the torrential rain. Skills I’m sure I’ll need in San Diego…um…never. The people have been, without exception, among the kindest, politest, and most welcoming I have ever met in my life. 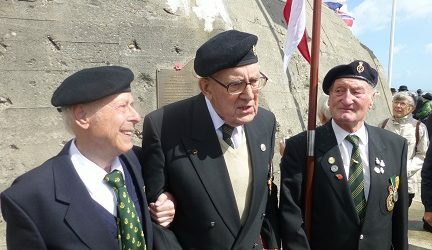 In York, the Escape Line Memorial Society (ELMS) gathered members of the French, Dutch, and Belgian Resistance, as well as some English WW2 veterans who escaped from German-occupied Europe along with family members together for a touching remembrance ceremony at an outdoor museum called Eden Camp. A former POW camp housing German and Italians, each barrack now houses an exhibit centered on a war theme. One building traces the escape lines used by Allied evaders and escapers at a high and tragic cost to their abettors. Many helpers were young women who put their lives, and their families’ lives on the line to help Allied airmen and soldiers get back to England. Vast numbers, sometimes in ratios as high as four-to-one over the men they rescued, were taken by the Gestapo, tortured, thrown in concentration camps, or simply shot. Saturday I drove to Nottingham and met up with Charley, my Afrika Korps friend, who had arrived the day before from Germany and spent the afternoon with his dear friends in the Sherwood Rangers tank regiment. After interviewing a WW2 Sherwood Ranger quickly upon my arrival, I had less than five minutes to smooth my hair and change into a skirt before we dashed off to the annual regimental dinner. The evening passed in a whirlwind, with Charley’s former North African adversaries welcoming him heartily and warmly. It was an incredible honor for me to sit among the six WW2 veterans who could still make it there. All too quickly, and sadly, it was over and we headed back to the hotel. This morning we interviewed two Sherwood Rangers involved in D-Day and the fight through Normandy, Holland and Germany. 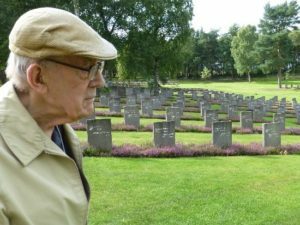 In the afternoon we visited with a gunner from a secret British naval flotilla involved in clandestine operations in both France and Norway. It goes so fast, and there’s simply no way to compress years of combat experience into two hours of an interview. Sometimes when time constraints cause us to break off just when we’re getting to the riveting parts, it’s actually physically painful to turn the camera off and pack up the gear. If you know of anyone willing to fund the effort to record the incredible stories of these heroes so that they can really be given the time required instead of always rushing, please be sure to pass their vital contact information along, would you? to England. Of course I have missed all of you terribly lately. Last night I boarded the 777 for London, dreading the upcoming all night flight. their great skill as superior pilots and a little bit of luck must have been on their side. taxi, I soon arrived at my hotel, dropped my bags, and walked to the Museum. couple of German fighter planes hanging from the ceiling, including a jet. 20,000 Ft. Wing on fire. How Brave are you? that in the same situation I could be as brave as they were.